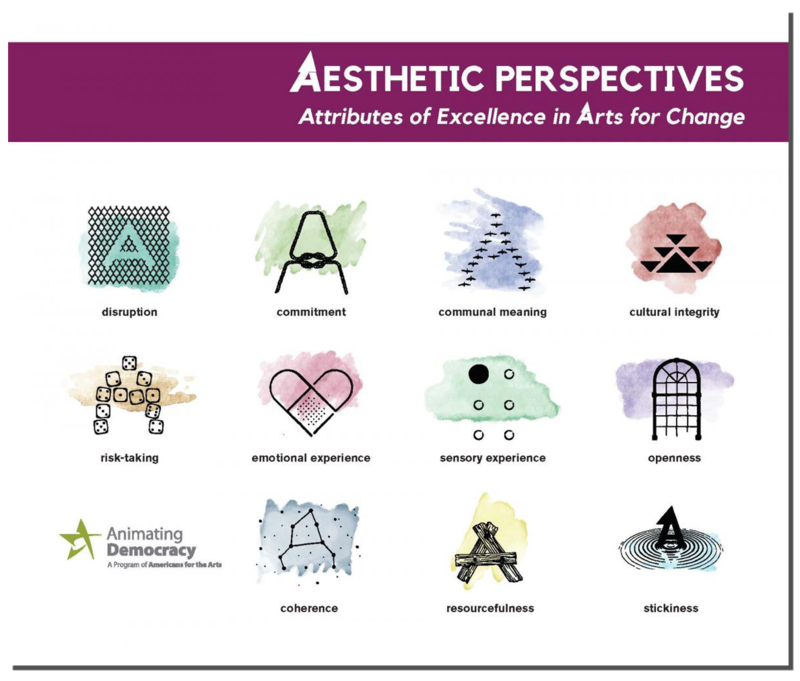 Learn how to use the Aesthetic Perspectives framework to: frame program mission, design application materials, guide processes for proposal review including panelist guidelines, and evaluate grantee outcomes. Read more about this new initiative and help contribute. New in 2016, Americans for the Arts, with support from the Nathan Cummings Foundation, is developing EQUITY 360, an online suite of resources designed to inform and guide grantmakers seeking to establish more equitable funding programs and practices. Read more about this new initiative and help contribute. The Arts for Social Change Funder Portraits are a series of brief papers and podcast interviews featuring funders who are supporting arts and culture as a creative strategy to achieve community building and development goals, civic engagement, or social justice goals. This curation of IMPACT Resources offers insight into funders’ perspectives on evaluation and impact. These pieces highlight philosophies and approaches to evaluation and work to advance meaningful measurement and communication strategies. The report, developed by Animating Democracy, a program of Americans for the Arts, assembles a first-time portrait of arts funders, social change funders, and others supporting civic engagement and social change through arts and cultural strategies. The Directory of Funders identifies and profiles private and public sector grantmakers that are supporting arts for change work to make community, social, and civic change. The Directory provides information on more than 150 grantmakers who responded to a 2010 survey as well as other grantmakers who have provided information since the initial survey. Practitioners: Find funders that support arts for change work. Grantmakers: Find peer funders and learn how they are supporting arts for change work. The Directory, along with the related report, can inform internal conversations and program design, as well as facilitate peer connections and sharing of reports and documentation. This companion to the Trend or Tipping Point report provides additional charts and graphs with data summaries based on the 2010 survey of grantmakers. This 2015 report details the current landscape of corporate support for arts and culture—one in which more corporations are focusing strategically on issues that align with their business interests and have a positive social impact on their employees, consumers, or the communities in which they do business. It builds off of Animating Democracy's 2010 Trend or Tipping Point report.